Like a bowl of mixed nuts, winter holidays can be studded with both joy and pain. The good — the pistachios and walnuts of the holidays — includes spending quality time with family, eating good food, and making new memories. The bad — stale peanuts and the crumbly, salty dust that lines the bottom of the can — resides in political talk at the dinner table, awkward conversations with relatives you barely know, and not being able to see the people you love most. 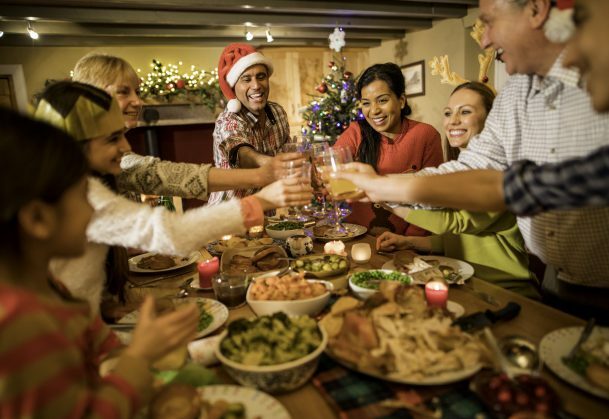 Luckily, research from psychological science sheds light on how we can maximize the good, making our holidays tastier, less lonely, and maybe even healthier. If you’ve ever thought that food eaten as part of a holiday celebration just tastes better, you may be right. In four experiments on rituals and enjoyment of food and drink, researchers from the University of Minnesota and Harvard University found that people enjoyed chocolate, carrots, and lemonade more after performing rituals compared with those who simply consumed the foods/drink, those who consumed the items after making random motions, and those who consumed the items after watching someone else perform a ritual. Results from the final experiment teased out the psychological processes associated with rituals, showing that involvement in the experience seemed to drive enjoyment. That is, the rituals made people feel more involved, turning the meals into an experience worthy of engaging in. So whether you are eating crispy latkes for Hanukkah, taking communion at midnight mass, drinking champagne at the stroke of midnight on New Year’s Day, or sharing what you are thankful for before digging into a celebratory meal, the rituals surrounding these experiences may enhance your enjoyment of them. Perhaps you’re seated next to the new neighbors at dinner. Or maybe you are visiting your significant other’s family for the first time this holiday season. No matter who you are trying to get to know, you may be thankful for the spiked eggnog during this year’s small talk. In an experiment involving 720 strangers, researchers at the University of Pittsburgh, the University of South Florida, and the Schroeder Institute for Tobacco Research and Policy Studies found that alcohol facilitated bonding better than a placebo or non-alcoholic control drink. The researchers put groups of three people in a room and told them they would be completing tasks at the end of 36 minutes. The subjects didn’t know that the 36-minute waiting period was the true experiment, designed to examine how people would interact when intoxicated. Every 12 minutes, the participants were served something to drink. Some trios were given a vodka-cranberry juice mixture, receiving about one shot’s worth of alcohol in a 36-minute period. Other trios were told they were getting alcohol, but actually received cranberry juice and flat club soda in a glass that smelled like vodka. Still other trios received cranberry juice and were told what it was. Video analyses of each group revealed that people in groups that drank alcohol shared conversation more, smiled simultaneously more often, and reported feeling closer to their group members than participants in either of the other two conditions. Previous studies have shown that simultaneous smiles and conversation sharing are indicators of group bonding. The findings suggest that a little booze may help you bond with a stranger – as long as you don’t overdo it. For those feeling lonely this holiday season, research suggests that a little taste of home might help you feel better. For their first of two experiments, researchers from the University at Buffalo, The State University of New York asked study participants to rate whether they thought chicken noodle soup was a comfort food and then had them participate in a lab experiment 1 month later. The participants ate either chicken noodle soup or ate nothing and were then given a written task that involved completing words based on a few letters. Some of these words had relationship associations (i.e., like, include, welcome), some had emotional associations but not relationship ones (i.e. joy, worry), and some were neutral (i.e. end, sort, now). Those participants who ate chicken soup and considered chicken soup to be a comfort food came up with more relationship-based words compared with those who didn’t think chicken soup was a comfort food and with that ate nothing. Importantly, those eating chicken soup didn’t score any better in positive emotional words than the other groups and they didn’t rate the soup as any tastier than the others did. This suggests that the effect was due specifically to associations linking the food with familiar people and experiences, rather than a simple relationship between eating and feeling happier or feeling like the soup was especially tasty. In a second experiment, participants wrote about a conflict they had with a friend and then wrote about the experience of eating comfort food or the experience of trying a new food. After they were done writing, the participants rated their agreement with statements about loneliness, such as “Right now I feel like there’s no one I can turn to,” using a scale from 1 (not at all true) to 5 (extremely true). In analyzing the food essays, raters found that both groups wrote about family and friends in relation to foods, but only those who wrote about comfort foods felt less lonely at the end of the exercise. Being lonely is rough, but traveling to see friends and family can bring its own headaches. Travel can weaken the best immune systems, bringing the sniffles along with gifts and reunions. In 2014, researchers from Carnegie Mellon University, the University of Virginia, and the University of Pittsburgh found that social support and hugs provide a protective effect against a cold virus and a flu virus. The researchers monitored 404 study participants for 2 weeks, interviewing them nightly about social conflict, social support, and hugs received that day. After this 2-week period, they exposed the participants to one of two diseases via nasal spray and quarantined them for 5 days to track their symptoms and markers for disease. Participants who reported strong social support and more frequent hugs in the preceding 2-week period showed less risk of infection overall and mitigated symptoms if they became infected. Hugging and social support were closely correlated, so the researchers could not definitively conclude whether it was hugging that helped battle illness or social support more generally. The findings do suggest, however, that reaching out to friends and family – whether literally or figuratively – may help keep you healthy through the winter months.